This post is part of the Austin Food Bloggers Alliance Austin City Guide 2012! Alborz is a Persian restaurant tucked away in a strip mall on Anderson Lane, nestled right next to Mo-Pac. Even though it’s a little hidden, it’s easy to get to because of its proximity to major thoroughfares, and well worth a visit. The menu is anchored by fragrant rice dishes and roasted and grilled meats, notably chicken, lamb, and beef, but they also have an array of Persian specialties such as kashk-o-bademjan (baked eggplant pureed with spices and topped with dried yogurt, mint, sautéed onions, walnuts, and garlic); Persian potato salad; and four house stews. My favorite was fesenjan–a tangy and sweet pomegranate and walnut soup. If you have room, they also have popular Persian desserts, including baklava; rolled cake with peaches and pistachios; homemade ice cream with saffron, rose water, cardamom, and almonds (everybody was ordering it! ); and sholeh zard, a bright rice pudding with saffron, and cardamom. To sample all of these things at once, along with your fill of dolmas, baba ghanooj, hummus, and tabouleh, check out Alborz’s award-winning buffet. The lunch buffet is $9.69 ($10.99 on weekends), and the dinner buffet (available Friday through Sunday) is $13.99. They also serve beer and wine. For a really special experience get there between 7:45 and 9:30 on Friday or Saturday night–they have belly dancers! Alborz is a little out of the way if you’re based downtown, but it’s a very popular weekday lunch spot for those who work in the area. The lessened weekend traffic makes a Saturday or Sunday visit casual and leisurely. Service is pretty good; last time I was there, as a single diner for the Saturday buffet, it was a bit slow. If you go in for a regular dinner, service is more attentive. The atmosphere is cozy and more elegant than one would expect considering the location. They have the now-ubiquitous big screen TVs (broadcasting NASCAR and Serie A last time I was in), but they are muted, so not too distracting. Alborz is popular for large family gatherings, workday lunches, and intimate dinners. Check it out next time you’re in the neighborhood! If you want a quick, affordable, varied Middle Eastern/Mediterranean meal, check out DiMassi’s. A chain, they formerly had two restaurants in Austin, but the south location has now closed. The Research location may not be convenient for everyone, but if you live in the area, it’s worth the occasional visit. This buffet is huge. They have all the Middle Eastern specialties you’d expect, plus all-you-can eat grilled meats, falafel, and a decent selection of desserts. The decor and atmosphere is not inspiring (think: loud, cafeteria-like), but, at $9.99 for lunch (11:00am – 4:00pm) and $11.99 for dinner (4:00pm – close), including unlimited trips, drinks, etc., it’s not a bad deal. This might be a good place to go with a large, diverse group of picky eaters who want to sample various Middle Eastern dishes for the first time; or for anyone who is really hungry and craving some quick lamb shank and lady fingers. This is hands-down my favorite Middle Eastern (slash New Orleans po’boy) place in Austin. It’s conveniently located on my walk home from work, the owners are friendly and knowledgable, they make most items to order, and their ingredients are always fresh and delicious. Owner Nuha Haddad is originally from Jordan, and came to Austin via New Orleans, which explains the seemingly odd choice of menu items. Flying Falafel has daily lunch specials rotating between authentic New Olreans staples (red beans and rice on Mondays) and Arab delicacies (the above-and-below-pictured menssef is served on Thursdays). They also have excellent seafood gumbo, catfish po’boys, and even fried chicken! But back to the Middle Eastern food. My boyfriend loves their falafel with tahini, hummus, and pickles. Other hits include the zatter pita (cracked wheat, oregano, sesame seeds, olive oil) with yogurt; the mixed beef and lamb gyro; madajara (rice with lentis and beans served with Arabic salad); and the chicken shawarma plate. They also have dolmas with either meat or veggies, baba ghanooj, tabouleh, hummus, and labneh, their delicious strained yogurt with fresh herbs (I can’t get enough of this stuff). But we need to talk about the menssef again. I first discovered this revelation a couple of years ago. I used to work a block away from Flying Falafel, and I’d regularly pop in to get lunch. The owner kept telling me to come back on Thursday for the menssef special, saying, basically, that it would blow my mind. I finally ordered it, and she was right! A simple but decadent dish, traditional Jordanian menssef is goat slow cooked for many hours in dehydrated salted yogurt balls reconstituted with water, then served over rice with a garnish of fresh herbs and pine nuts and/or slivered almonds. At Flying Falafel, you can choose from lamb, chicken, or a mixture; but be sure to get there before 1:00pm on Thursdays to get the lamb–they always run out! Prices range between $3.99 and $11.99, so there’s something for everyone here. Kismet is another campus-area gem, located next to the Castilian dorm on 24th Street. This is a great place for lunch, because of their special (as shown above! ): $5.55 for any pita wrap, plus fries and a drink. The wait is a little long sometimes, but you can’t beat that deal. Their gyro is pretty standard; coupled with crispy fries and their delicious, garlicky hummus, it’s a filling lunch. Other wraps available on the lunch special include chicken or beef shawarma, falafel, kafta kebab, fried kibbeh (fried bulgur and chopped meat), Santa Fe chicken, eggplant, or mixed veggies. 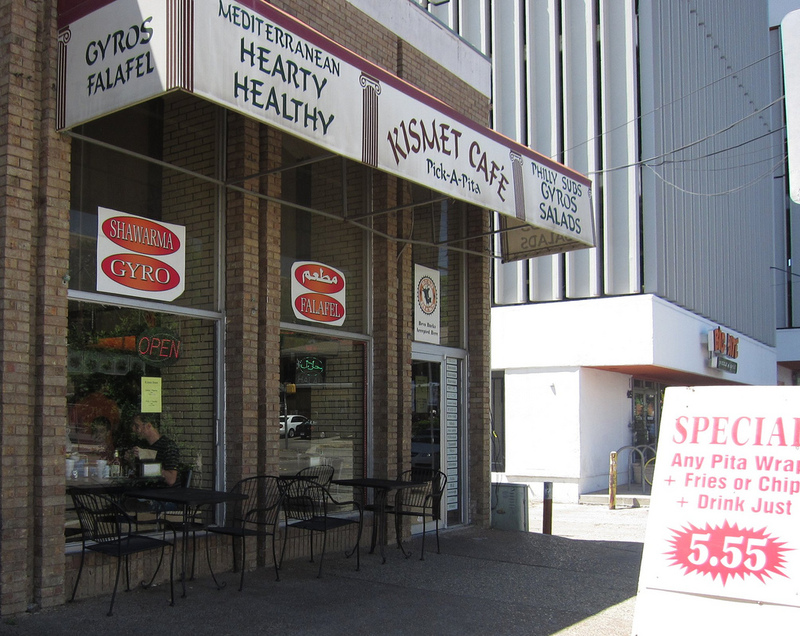 Kismet, while serving up an impressive menu of grilled, sliced, and skewered meats, also caters to vegetarians with a separate menu including various mezes, wraps, and a vegetarian sampler plate. Desserts include baklava, rice pudding, knafeh (a Palestinian sweet cake made of shredded phyllo), and nammourah (a.k.a. haresee, a delectable honey cake). Maoz, an international chain of vegetarian falafel restaurants, has come to Austin! They are located in the Triangle and are open until 11:00pm Sunday through Thursday, and until midnight on Friday and Saturday. My previous Maoz experiences had all been in London, specifically in Soho, specifically at 1:00am, and always, always drunk. Maoz was where I first discovered the heavenly combination that is french fries and mayonnaise (thanks, Alex!). The storefronts are always very clean, shiny, and efficient: fast food falafel. Having said that, they make a decent product, allow you to customize your toppings Subway-style, and may just be what you’re looking for if you’re in the mood for a quick, crunchy falafel wrap. Note: Today’s Groupon is for Maoz! Phoenicia, with two Austin locations, is your go-to stop for stocking up on imported Middle Eastern (and other foreign) goods, from ghee to pine nuts to halal meats to candy bars to coffee to… British pork pies? Yes. They have everything. Stefon would love this place. I’ve lived in Austin for eleven years, and I’d never been to Phoenicia until last week. My friend Mike (photo contributor to this piece) and I went in to pick up a picnic dinner from the deli at the Burnet location. 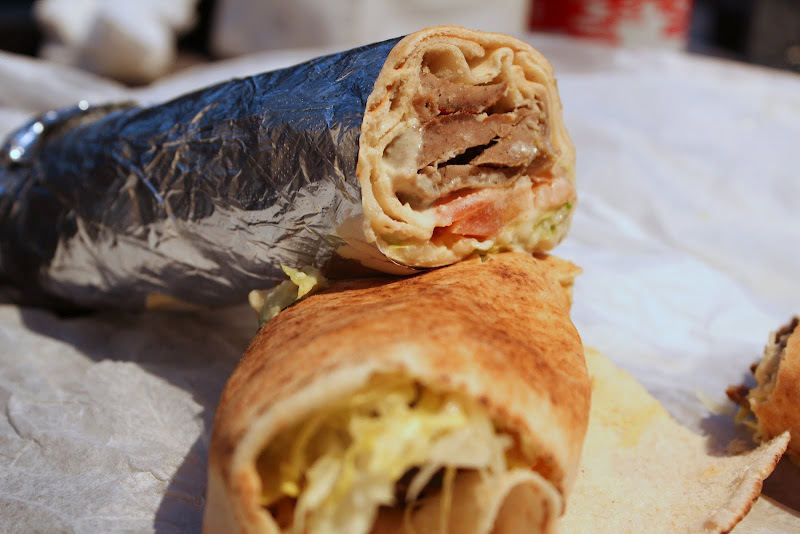 We ended up trying the mixed lamb and beef gyro, kafta wrap, and a chicken shawarma wrap with tahini. These were some good wraps, made extra special by Phoenicia’s homemade pitas. They also serve an award-winning whole roast chicken (only $3.99! ), along with your usual Middle Eastern staples: hummus, tabouleh, and falafel. You can also fill up on manaish (a.k.a. zatar, a warm pita rolled with a blend of imported thyme, olive oil, and spices), lahme-bi-agin (meat bread with ground beef, tomatoes, and spices), and cheesy feta and sesame bread. The deli has an interesting array of imported soft drinks, too. Mike tried the Camlica, because the can looked cool, and it turned out to be a carbonated, lightly lemony drink (l later found it it’s Turkish). Note that Phoenicia is primarily a grocery store, so there is limited outdoor seating. This is a place for shopping and take-out, not a romantic dinner. However, the service is great, and the take-out is really, really good. Go there. This is my new favorite restaurant. Located in increasingly hip Allandale, with a diverse group of shops withing nearby walking distance, Sarah’s is another imported grocery with a small cafe. Their selection of groceries is very impressive. I want to go back soon just to browse! Aside from having delicious food at very reasonable prices, Sarah’s is most famous for having the friendliest staff you’ll ever meet, and a casual, homey atmosphere. Squeezed in among the aisles of sesame paste and giant cans of olives is the busy kitchen, and there are a few bright, four-person tables in the front window. To start with the basics: Sarah’s has the great hummus. Look at all that garlic! They also serve all the usual Middle Eastern mezes, including baba ghanooj, meat- and vegetable-stuffed domas, tabouleh, and those pan-Mediterranean favorites, baklava and tzatziki. A selection of halal pita wraps are available, filled with your choice of falafel, chicken, beef, kafta beef, or gyro beef. The lamb shank rightly gets high praise–it’s succulent, tender, and well spiced. Even better than all this, in my opinion, are the shawarma plates. These are a real steal. For $5.99, you get a huge meal of flavorful, lemony chicken shawarma dusted with slivered almonds on a bed of paprika-sprinkled rice, a fresh salad, a big serving of hummus, two slices of pita, and a sweet date for dessert! The beef version (pictured up top) is just as delicious, with such savory grilled meat. If you are in the Rosedale/Allandale area in North Central Austin, do not miss this place. I cannot believe I don’t have any of my own photos of Tom’s Tabooley. I’ve been going there for ten years!Conveniently located on the funkiest section of the Drag (Guadalupe at 30th Street), Tom’s has been serving up their famous tabouleh, hummus, and wraps for years and years. You may recognize their logo from the deli case at one of your favorite local delis or grocery stores. Or perhaps you’ve seen their round stickers on light poles and guitar cases around town. Tom’s is the go-to place for fresh mezes. They make superior versions of all your favorite meze standards with a Texas twist: hummus (regular, roasted garlic, roasted red pepper, Kalamata, spicy Southwestern), baba ghanooj, falafel, dolmas (traditional, dill mint, curry, jalapeno, or habanero), and labneh. And they also have a variety of extremely fresh, shockingly affordable wraps, including: hummus with salad; mixed veggies; tabouleh and hummus mix (a favorite); the Tabouley Melt with cheese, grilled onions, and mushrooms; falafel with feta; chicken; mixed lamb and beef gyros; and the ever-popular Thai Wrap, with rice noodles and your choice of falafel or marinated tofu (ranging in price from $4.50 to $7.50). There’s also the Mediterranean Sampler for $7.00 (for those of us who want it all), salads, and homemade baklava, halva, and fudge. Tom’s menu helpfully denotes vegan and gluten free options, and even includes a Gluten Free Special ($8.00), including baba ganooj, dolmas, hummus, labneh, chicken, and salad. Tom’s is a great place for casual dining with a side of people watching, due to their location on the block that houses weird Austin institutions Toy Joy, Buffalo Exchange, and a liquor store. Hang out for a while under the patio umbrellas and soak it all in. This entry was posted in Austin, Middle Eastern, Reviews by Susan. Bookmark the permalink. Mmmm I haven’t been to many of these spots yet, so it will be helpful to have this list handy when I’m craving Meditteranean. Thank you so much for posting! Never thought Persian food had so many nuts! I love this post! I’ve been to all of those places except Alborz (but i think i’ve had some kind of take out from there a while ago). We LOVE Sarah’s Mediterranean Market. They are the NICEST people and their food rocks. I love their falafel over Phoenicias. When I went to college here Phoenicia’s seemed the only place to get a real falafel sandwich, and I’m so glad there are more restaurants now. I enjoy fesenjan too and make it at home. But I’ve never had menssef–my husband would LOVE that! You’ve gotta try the menssef! Today’s the day! It’s the Thursday special. I also blogged about Sarah’s! It’s amazing! I hate to say it, but I went to Phara’s for the first time last weekend and had a really negative experience. The courtyard where we sat was beautiful, but everything other than that was bad. It took the waiter forever to take our order, and when he finally did, they were out of both the beef and the “specialty of the house” lamb entrees. It took TWO AND A HALF HOURS after we arrived for our food to finally come to us. And, it wasn’t anything to write home about. So disappointing. We love Sarah’s too, but I’ve been wanting to try the Flying Falafel & Po’ Boys so I’m glad I got to read your review. So glad to hear about Sarah’s! I do love Phonecia’s food, but, honestly, I’ve had some pretty gnarly customer service experiences on more than one occasion, each by the owner’s, no less, so to hear that Sarah’s has such a friendly staff AND groceries, along with good food….well I’m THERE. When I lived in Central Austin, I sent my husband to Kismet Cafe for the veg plate so often that they just started fixing it when they saw him enter. LOVE their roasted cauliflower, among the other fine food, and,they’re a pretty fun group of people, too. I’ll have to try Maoz, upon your recommendation. And that Dimassi’s buffet is crazy big. I love their Baba Ghanous, and eat a big plateful with their tabouleh. If I have any room left, I nibble on some of their other goodies, too…lol. Thank you for your thorough examination of my favorite ethnic cuisine. Now I’ve got some cravings. The guys at Kismet used to correct Tom when he got the plate wrong. I love them. Sweet! I’m excited to find so many options for Middle Eastern in Austin. My husband and I have tried Tarbouch and Arpeggio. Both were pretty good, but we haven’t found true love yet. Perhaps something on your list will be “the one”. Thanks!